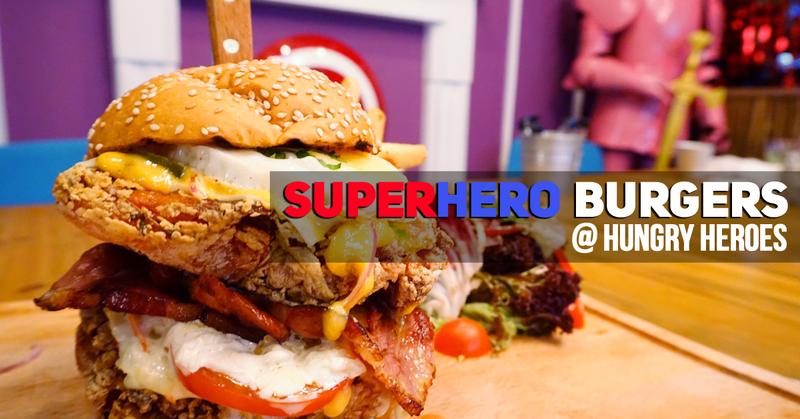 Hungry Heroes - The place they serve you the "Mother of all Chicken Burgers"
Located in Farrer Park, Hungry Heroes is Singapore's first superhero-themed cafe. Charge up your phone and camera before heading there because you would definitely snap A LOT OF PHOTOS. Especially if you are a Marvel/DC geek like me. Meticulously adorned with superhero figures and memorabilia, you would be in awe at the comic collections of the owner. And also wonder why he is so rich. I shall let you discover all the other figurines yourself when you head over there. Remember to explore every crook and cranny (and that means both 1st and 2nd floor) because EVERYWHERE IS A SUPERHERO-SURPRISE. If you have watched the video, you must have felt really intrigued by this Super Soldier Serum. HOW COOL IS THIS? I WAS LITERALLY GEEKING OUT when I saw this bucket of test tubes. Who doesn't want to be an enhanced super soldier? A mixture of grapefruit juice, vodka and choya, the Super Soldier Serum makes for a nice, sweet alcoholic concoction to start your superhero meal, while, at the same time, fulfills your fantasy of becoming an enhanced being. TOTALLY WORTH IT. GET THIS: This is actually a combination of DUCK FAT potatoes, kewpie mayo and spring onion. YES DUCK FAT POTATOES. Can you imagine the amount of sinful pleasure in this? Surprisingly, it wasn't very greasy at all, and the addition of scallions helped to delay the "jelak" (sick) feeling that would usually accompany the combination of potato+mayo. A very interesting starter that adventurous superheroes should try! The chef at Hungry Heroes must possess some form of superpower. How else can he continuously come out with food that makes you feel so sinful, yet you simply cannot resist not gorging on them? The Heroes Fries is served with generous toppings of beef chilli con carne, nacho cheese and mayonnaise. As someone who likes my fries spammed with lots of nacho and cheese, this combination is a god-send. Or should I say, hero-send? Do you know where the term "spider-pig" is referenced from? If you do, well, you are old. BUT THAT'S OKAY because old is gold, right? There is nothing funny about this Spider Pig Burger though. In fact, this is a dish you might want to relish in quiet thoughts because OH MY GOD SO GOOD! Consisting of hand-shredded pork shoulder, fried egg, coleslaw, pineapple and their secret spice BBQ sauce, I could not stop gushing about the burger when I sent it into my mouth. Having disappointed by a few pulled pork dishes in Singapore, I half expected the pulled pork to be dry and tasteless. BUT NO. This pulled pork was tender, juicy and full of sweet and spicy flavours! If you love having pineapples in your bread (eg. Bo Luo Pau, Hawaiian breads), you would definitely appreciate the taste of this one. This pork steak is everything you want your pork steak to be: tender and flavourful. Seared in a blaze after a sous-vide bath, the juices locked inside the meat explodes in your mouth with every chew. The aroma of bacon quickly spreads inside, with the sweet notes of honey thyme bouncing off the surface of your tongue. Another amazing creation by the superchef. As depicted in the video, this burger is MASSIVE. Like, even-Hulk-might-find-it-daunting-massive. Consisting of 2x fried chicken leg, cheese, coleslaw, caramelised onions, bacon, pickled jalapeno, tomato and cajun mayo, this is a burger befitting of its name. I am really amazed at how they managed to keep the chicken leg firm and juicy even after it was fried. Every single ingredient that went inside this burger complemented each other well, and our bellies were super satisfied after we devoured the burger. They always say that you should bring a girl swimming on your first date. Well, how about bringing her to Hungry Heroes and watch her gorge on this burger instead? It's almost the same effect, but at least this is funnier. Hungry Heroes gets almost a perfect rating from the Evilbean, and that is partly because I am a comic-book nerd + meat-eater, and the meat served here are gorgeous. Thank you ZQ from Hungry Heroes for being such a kind host!